Verywestham: Is Sturridge Really better than Sakho? The rumour mill keeps swinging back to the possibility that West Ham might try to bring England striker Daniel Sturridge to the Olympic Stadium to bolster our impotent attack. However, despite the sickening manner of the defeat, Saturday's game did bring a host of positives. 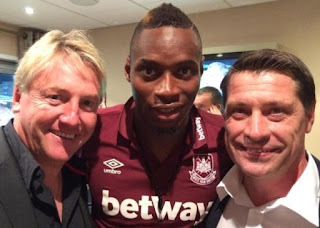 Chief amongst these was the return of Diafra Sakho. The Senegalese hitman has had a series of issues over the past nine months, both personally and professionally, but is finally back in claret and blue and looking to recover the sort of form that characterised his arrival at the club in August 2014, where an explosive start saw him bag six goals in as many games! Having almost exited to West Brom back in August, Sakho failed his medical and has endured a long journey back to fitness - one which has given him plenty of time to ponder on the vagaries of life! Now he's back and looks keen - bringing his characteristic physical edge to Saturday's game where as the lone striker he hassled the Spurs defence vastly more than Zaza, Calleri and the rest have done so far this season. Understandably, he was substituted after an hour as he is still trying to get back to match fitness, but one wonders if he would have done better with the two on one break that presented itself to Simone Zaza with under ten minutres to go when we were 2-1 up. A third would have seased the win and prevented the nonsense that ensued but Zaza dallied and fluffed his lines. Which brings us back to Sturridge. His well documented (but poorly understood) injury problems are a definite negative. Consecutive Liverpool managers have made unusual comments about his commitment to playing suggesting, to this onlooker at least, that a 'psychological overlay' might be at play. With Andy Sicknote already soaking up a massive part of our wages budget, maybe another injury-prone striker is the last thing we need. And then there's the strike rate. Sakho has a 33% scoring rate but brings a lot of physicality to the game and opens things up for others, forcing the opposition to defend deeper. Sturridge's is a little better at 37%, but much of this surplus mostly relates to the period he spent hovering up the rich pickings alongside the phenomenal goal machine that is Luis Suarez! Maybe we need to stick with Sakho. For many fans, ex-Hammer Jermain Defoe looks wasted at Sunderland where even in a limited side he has 42% hit rate, with 18 goals last year and 7 already this season. After 12 games no striker at our club has hit the net! Now 34 years old, Defoe would only be a stop gap until we can truly bolster our attack in the Summer, but maybe the bright lights of London and the Floodlights at the Olympic Stadium might appeal? However, having tasted relegation once before with the Hammers, he might want to pass on another stint at the club as we are slipping perilously close to the drop zone and last season he proved how his contribution can be the difference between Sunderland staying up or not. They’d be mad to let him go! In fairness we only has 33% possession on Saturday - with that little of the ball it's hard to see where the chances will come from. We're on the lookout for sites to feature some of our clients sponsored post on and we stumbled upon yours. We would like to know what you asking price will be for such project so we can get back to our client. We await a favourable response from you.